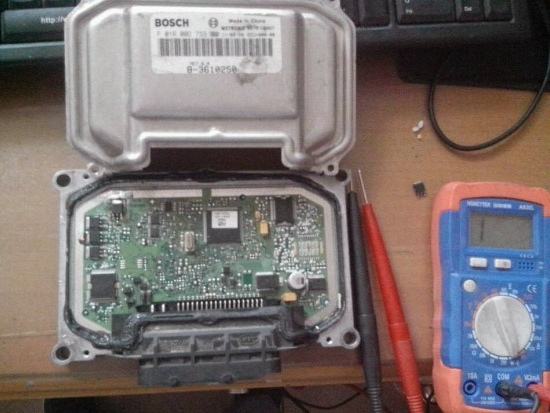 Several days ago,my friend Bob driven his Nissan Fengshen to my garage to ask for help.He said that his car vibration when driving.And i tested the symtpom,it really terrible.For educational purpose,I share the progress of How to solve Nissan Fengshen vibration caused by ECU problem. According the experience of repairing,it most likely that misfiring engine cause car vibration. 1. Checked the ignition coil wiring plug,and removed the ignition coil wiring plug of first engine cylinder,found the vibration still exist. 2. Then replaced others ignition coil wiring plug with first cylinder’s,I found difference is obvious. 3. Re-connect the ignition coil wiring plug to first engine cylinder,found the trouble exist still. Above operation and result most likely proved that the ECU get trouble and can not generate high voltage ignition signal.And we need to follow the principle of simple to complex.So i remove the ECU from Nissan Fengshen,and checked the pin that give the ignition signal to first engine cylinder coil wiring plug,and found there is a audion occuring short circuit. After replacing a new same model audion,and installing all of parts back to car,starting the car and found the vibration and misfiring engine trouble disappeared.